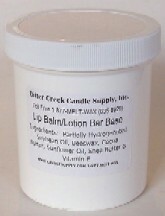 Lip Balm & Lotion Bar Base 16 oz. Our creamy, all natural base is great for lip balms, lotion bars, body butters, solid perfumes, glitter sticks, elbow grease, etc! Can be used in push up sticks or soap molds! Easy to use, just melt and pour! Can be used with flavor oils for lip balm, or with lotion safe fragrance oils for lotion bars! This is an oil/wax based product and will not mix with water based FD&C dyes. Do not use candle dye! Cosmetic Mica powders may be used for shimmer or color in lotion bars. Lip safe micas may be used in lip balms. *This Base is Gluten Free! This base is also made with beeswax, which makes the base not vegan. Although, the beeswax is a bi-product of the bee and the bee is not killed. * Menthol "Vapor Rub" Stick� use eucalyptus & camphor or peppermint, tea tree oil, etc. *Under Eye Moisture Stick (best unscented for use near eyes). *Lip balms (use our Kiss Kwenchers pre-sweetened flavor oils, or edible EO's)* Lotion bars (use lotion/skin safe fragrance oils only). *Solid perfume sticks great for purse size & travel! *Elbow grease excellent on rough dry elbows, knees and heels! *Cuticle conditioning balm for fingernails & toenails - sell in sticks, tins or jars. *Body butter try whipping it! *Massage bar use massage bar soap mold and relaxing EO's! *Shimmer stick add mica powder and/or cosmetic glitter for a sparkly perfume stick! *Make up remover stick - use unscented in eye area. *Suntan butter bar - use a tropical scent like Pina Colada or BNL Coconut Bay! *Pampered Paws Doggy & Kitty Paw Balm for rough or cracked animal paws! *Market it as either a Shea Butter, Cocoa Butter, Soy lotion, vitamin E bar, etc. *Use with EO's for an all natural product. Lip Balm: Just melt the base in the microwave on low until it liquefies completely. Add your flavor oil (not fragrance oil!) and stir well (amount depends on manufacturer, average use is 3-6% or 1/2 to 1oz per pound). Sweetener is optional with non-sweetened flavor oils or essential oils (our Kiss Kwenchers flavor oils are pre-sweetened ). Pour into lip balm tubes, tins or pots, and allow to harden. Lotion Bars: Just melt the base same as above, and add approx. 1 oz. of a lotion safe fragrance oil per pound of base, and stir well. Pour into soap bar mold or into push-up sticks and allow to harden. This base can also be whipped and packaged in jars or tins as a body butter or balm. Fragrance Measuring Chart: Click here for our handy measuring chart when doing less than gallon quantity. Chart is based on fragrance use of 1 oz. per gallon. Colorants: Mica work well in this base. This base is made from oil and water based colors will NOT mix. Packaging: PET or HDPE plastic packaging is recommended for your finished product. Storage: Store this product in it's original container tightly closed at room temperature. Best Used By: One year from your date of purchase. We recommend using a sharpie marker to date your stock once your receive it. Also be sure to rotate your stock with every shipment to use the oldest stock first. Glycine Soja (Soybean) Oil, Cera Alba (Beeswax), Helianthus Annus (Sunflower) Seed Oil, Theobroma Cacao (Cocoa) Seed Butter, Butyrospermum Parkii (Shea Butter) Fruit, Tocopherol Acetate (Vitamin E). Dragon's Blood (2019 dupe) *COMING SOON! Awesome product very smooth...lip balms are always one of my best sellers no matter where I sell! Love this product. Very smooth. Excellent seller.